Philippine National Police hang flags in a part of the war-torn city of Marawi ahead of Independence Day celebrations, June 11, 2017 (NurPhoto by Richard Atrero de Guzman via AP). JAKARTA, Indonesia—Two months after a coalition of extremist groups affiliated with the self-proclaimed Islamic State swept into the city of Marawi in the southern Philippines, provoking a large-scale military siege to retake it, the militants continue to maintain control of sections of the city. 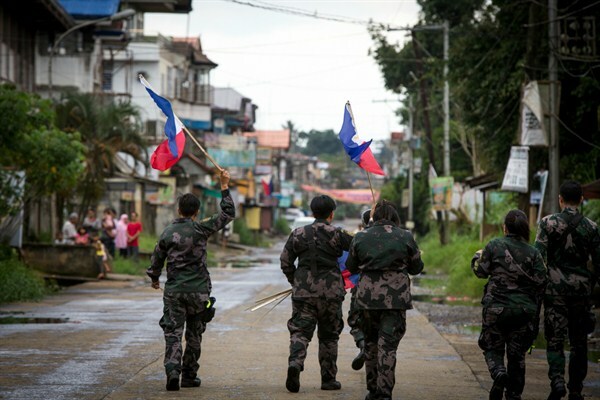 Hundreds of thousands of civilians have been evacuated from the charred and bombed-out city, a testament to the power of the militants to challenge an underequipped and inadequately trained Philippine military. Since the siege began, President Rodrigo Duterte has repeatedly trumpeted the army’s incipient victory. Now it looks likely that Duterte will deliver his State of the Nation address on July 24 while parts of Marawi remain in militant hands.